credit: prayitno (Flickr)Online dating safety has always been a hot-button issue, and it can be intimidating to newbies. But just like dating a new person who you meet at a bar or through friends, it can be perfectly safe as long as you’re smart about it. Throw away those old-age notions, like the guy picking up the girl at her house or walking her home. Drive yourself and meet your date at your destination — that way you’re not dependent on another person to get home and won't let a stranger know where you live. That, along with the perfect danger-proof destination, will put your mind at ease and let you fully enjoy yourself. Here are our top five safe places to meet up for a first date. 1. At a park during the day. A park on a warm summer day can be a great place to break the ice. Grab some lemonade, stroll around and talk about your favorite things. Keep your walk to non-secluded areas and make sure there’s always someone within eyeshot. Also be careful not to walk too far from a road so you don’t get lost. 2. At a bar. A bar is a great causal place that’s guaranteed to have at least one person nearby — the bartender. Keep your night to a two-drink max to make sure your inhibitions aren’t too vulnerable. 3. At a wine tasting. 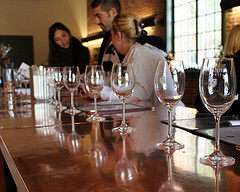 A wine tasting is a cool interactive experience that’s sure to inspire fun conversation. It’s also a public outing with many other couples nearby, so there’s sure to be no funny business. 4. At a specific local event. Is there a unique event going on nearby, like a street fair or a play in the park? Take advantage of it! Enjoying your city is something you can both immediately have in common. Again, make sure to always stay in a public area and be careful not to loose track of familiar landmarks. 5. At a fun activity. Think along the lines of bowling or visiting a local zoo. This will bring out the kid in you both, and will immediately lighten the mood. Both these examples are well lit and very public. There will also be young children around, creating another safety barrier if the other person gets any funny ideas. Bottom line — keep first dates to a public place and always have an exit strategy. Don’t ever be reliant on someone you just met for anything involving your safety. But remember to have fun! If you’ve taken the time to get to know someone online, there will be less of a chance you’ll be surprised by anything less than a great first date. Know of any other safety-secure date spots? Share them below! Fail to Fab: How Long Have You Been Online Dating?